Do click through and read this most interesting article, about how people all over the UK and wider thought about these lovely fossils – sand dollars, brain dollars, heart and loaf stones; I know them by many names, and the author (who works at the Natural History Museum) has pulled together a fascinating collection of stories around them. Every year, my family hard-boil eggs, and paint them with watercolours whilst they’re hot; it’s a Russian tradition. They’re rubbed with butter to make them shiny, and to preserve them for a few days. The eldest female gets to paint an all-red one, representing the Virgin Mary. Then we have egg fights – highly formalised; the aggressor gets one blow with their egg onto the end of yours. If either egg cracks, it’s turned over; then the other person gets a turn. If both ends of your egg crack, you lose, but you get to eat it; if you have an uncracked end, or even two, you win, and you need a new opponent before lunch! The Virgin Mary is the last egg to be fought with. Decorating techniques are often highly individual – personally, I like colour blocks and jagged lines, having the artistic ability of a dead duck; my father’s eggs were swirly purple abstract art, and my animation-trained elder daughter goes for realism. We did catch my younger daughter one year painting extra layers on the ends of hers, just to reinforce them; egg fighting is very competitive indeed, not for the faint-hearted! Imagine my delight when I found this super article on egg painting through the ages – not only are there designs which I shall shamelessly nick on Sunday, but how fabulous to be taking part in a tradition dating back to the Paleolithic! How fascinating, that the skull was plastered at all – and that we have found several of them, implying many more have been lost in the intervening 9,000 years! Even more interesting, that the lower jaw was removed. You can see problems in plastering with this great flappy row of teeth – and if you bound it, the binding would show above the plaster. 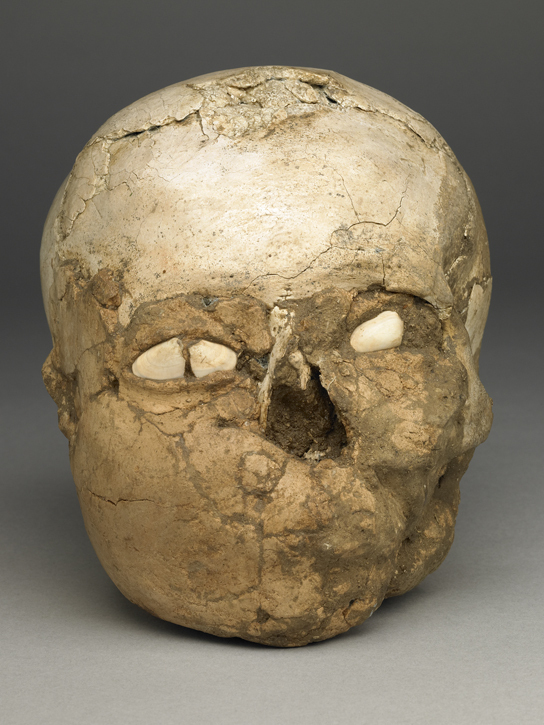 The people who did this clearly knew what they were doing, with different densities of clay inside and outside the skull; ergo, had done it before – perhaps many times. Even the fact that most of the plastered skulls we have are male could merely be an artefact of the thousands of years of danger; more gracile skulls would be more easily damaged. So, as a writer, I’m free to speculate as to why, and what they looked like. I imagine a loved one’s body being laid to rest on a sky-platform, exposed to the elements and chance predators for the year it would take the family to return to that spot; then the cranium carefully rescued and treated to its plaster coat, complete with lips and ears. Equipped with those, you can speak and listen… Were they painted, too? Would you add, say, a distinctive scar or mole to the plaster, or once dead, was everyone the same? I think that, given a nomadic lifestyle, these people would have been left as markers of territory, able to curse any stranger who wandered by without permission. Can you imagine climbing a hillside, rounding a corner, and coming face-to-face with rows of skull-people, their blank eyes seeing both you and the other world simultaneously? Enough to send you screaming! It’s always a problem for museum curators to find ways of learning more about the objects in their care without damaging them. For human remains, it’s even more complicated because there are additional questions of care and respect for the dead that have to be carefully considered before any research can be done. However, by studying their remains we can find out an enormous amount about the people of the past; about their health, their diet and about the religious practices they carried out. The Jericho skull shown with face forwards. The eyes are made from shell. OK, so I still have a couple of bags of stuff to wash, and the PAS Finds Liaison Officer can expect another visit from me at some point, but I have largely finished with last year’s digging writeup. My main site last year was a tale of Bronze Age settlement, and pre-enclosure paths, which has produced some amazing flints, again. Also, I was very surprised to see the paths bracketed by little clusters of thumb-scrapers – which clearly mark hut patterns; you don’t take a tool used only for preparing hides on a hunt. These paths were strip villages, 3,000 years ago! Bang go all my preconceptions about a violent, inward-looking society! My winter digging this year was mostly just across the valley from my summer site. There is an at least 3,000yo main N-S footpath, whose onward travel is unclear; I wanted to nail it down over the winter. Unfortunately, nothing conclusive came up; there were still three possible routes. Then the shooting season finished, and I moved back across the valley, just to the North of where I finished last year. Bang! There’s my route; and the spring that people stopped at before crossing the stream. I can now trace the route another 3-4 miles northward – and a little further on, there’s that peculiar arc of fields that designates a Saxon settlement. Very satisfying when things come together like that! I shall have to see who owns those fields next winter, and see if they fancy a resident metal detectorist for a few months! 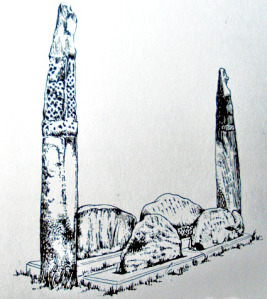 I shall also have to set out my evidence for the local Archaeological Unit, I think it will be new evidence for them, or they might be able to add to it. I am attempting to organise the various aspects of my life, by using separate notebooks for archaeology/detecting and writing. The trip to the British Museum last Friday was a classic example of when that doesn’t work; too much crossover! I’ll try again here. I am particularly worried ab0ut rivets at the moment; it’s too easy for something like a shield boss to deteriorate in our locally very acidic sandy soil, and for the copper alloy rivets to be the only remaining evidence. 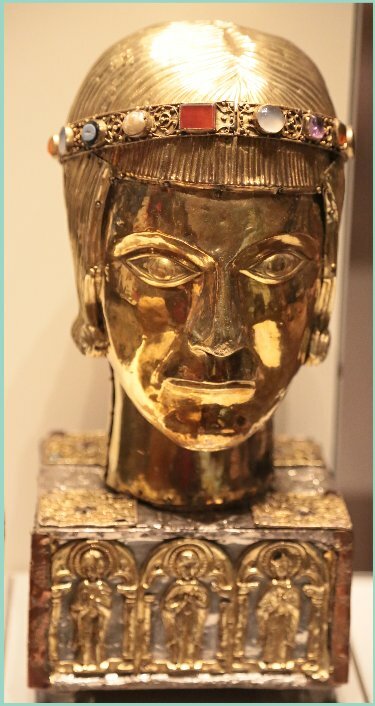 Plan A was to visit the Sutton Hoo exhibits (Room 2, ground floor), then go upstairs to rooms 49-51, Roman through Early Mediaeval, with a detector’s hat on. Look what Basil Brown achieved, with those beautifully laid-out rows! Unlike him, though, I get my rivets tumbled in plough soil, and so it’s important I know what I’m looking at, and I wanted to see the evolution of rivets through time. Then the organisation attempts failed again, as I wanted the larger writing notebook to take some sketches of buckles. I am now equally as worried about buckles as rivets; again, the design hasn’t changed appreciably since Saxon times. I got really into the detail of the Saxon workmanship; here are some notes in the writing notebook, so I don’t lose them! A seax is about 10″ long, this one very crudely made at the cutting edge, but the flat edge decorated beautifully. It was a woman’s; would a man’s be different? Pins for a woman’s veil were needle-fine. An actual needle was about 3″ long and thicker! 10 shallow silver bowls found at Sutton Hoo, for serving food; decoration is unique circular devices at bottom, cruciform arms patterned out. Bowls 9″ in diameter, 3″ deep. Lovely! The wings of the bird on the helmet look like boars – which would make most of the major Celtic animals represented? The roof height of a typical Saxon hall was 5m! 2 stories – not bad! Would mean that churches were not as impactful as I’ve been imagining. Saxon sword bosses were quite small, but the Bronze Age ones were much bigger. Would be interesting to know how that affected function, and use of the boss itself as a striking weapon. You can make a wire torc by wrapping the wire around a springy dogwood or alder twig – then burning away the wood to reveal the heart space inside the gold! I bet that was a magical, ceremonial moment. Then the last note of the day was back in the detecting notebook – a comment on the changing representations of Christ over time. Pre 1100, the feel was around the strength, invulnerability and majesty of the Christ figure, even on the cross; after that date, there was a deliberate shift, by church policy, to images designed to invoke pity. That should definitely have been in the writing notebook, because presumably the shift was still happening in Wimer’s time – that’s a lovely subtle way of depicting a church, or an individual, as old-fashioned or following new-fangled ways! 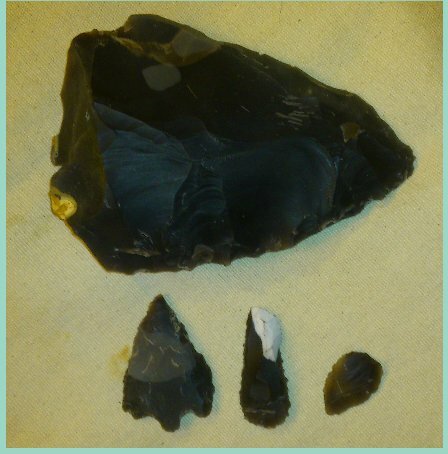 I’ve found this lovely description and set of pictures of tranchet axes at Star Carr – from around 8500 BC. Also a video of Will Lord making a handaxe, then turning it into a tranchet style one. The key is the last blow parallel to the edge, giving you a razor-sharp cutting surface. When it breaks or dulls, you simply repeat the process – if you’re lucky, the striking platform will still be there; so it’d take you seconds to sharpen your axe. 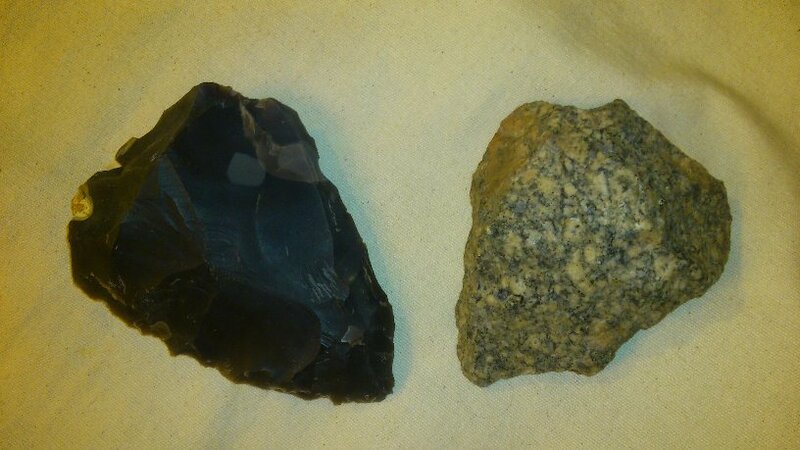 I have decided that I love knapping 🙂 Actually, even better – given my complete lack of 3D visualisation skills – that I love watching someone who knows what they’re doing, knap! Yesterday, I watched in awe as Will Lord casually knocked out axe after axe after arrowhead; then very patiently went round and made tactful suggestions about the attempts we were making. He is a brilliant teacher, and it was a fascinating day; half-a-dozen of us sat around a wood fire, happily reducing great nodules of flint to rubble. I completely failed in the hand-axe department. I tried three times; I could get to a certain point, then just couldn’t see the way to make the next platform to take the next slice off. So I shall have fun playing with the head-sized nodule Will sent me home with – as soon as I’ve found suitably thick gloves and leg-pad! And I’m already saving up to do the day again. Or maybe his bronze-casting workshop. Magic!